Instant downloads of all 942 LitChart PDFs (including Thank You for Arguing). A famous ancient Greek philosopher, cited many times by Jay Heinrichs in the book. Aristotle was one of the founders of the art of rhetoric, and divided rhetoric into three forms of argumentation (forensic, deliberative, and demonstrative), in which speakers could use three methods of persuasion (logos, ethos, and pathos). ). Note: all page numbers and citation info for the quotes below refer to the Three Rivers Press edition of Thank You for Arguing published in 2013. Suddenly, an intractable, emotional, values-laden issue like abortion begins to look politically arguable. Making abortions rare is to the nation's advantage, as Aristotle would say. Now, what are the most effective (and politically popular) ways to make abortions rare? The answers might give the extremes of both sides a lot to swallow; on the left, pro-choicers would have to agree that abortion is a repugnant form of contraception. On the right, pro-lifers would have to allow some abortions. 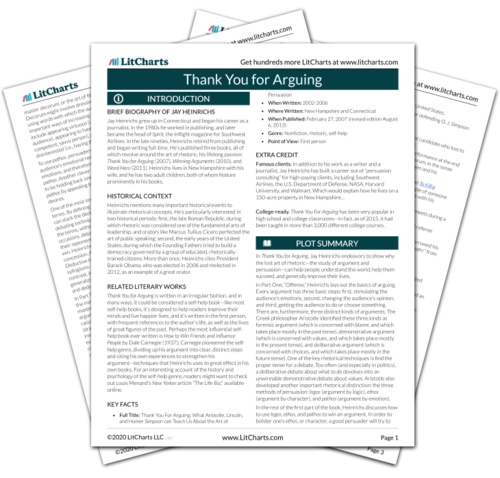 Unlock explanations and citation info for this and every other Thank You for Arguing quote. I know reasonable people who hold that opinion. So who’s the extremist? The timeline below shows where the character Aristotle appears in Thank You for Arguing. The colored dots and icons indicate which themes are associated with that appearance. Arn, Jackson. "Thank You for Arguing Characters: Aristotle." LitCharts. LitCharts LLC, 2 May 2017. Web. 22 Apr 2019. Arn, Jackson. "Thank You for Arguing Characters: Aristotle." LitCharts LLC, May 2, 2017. 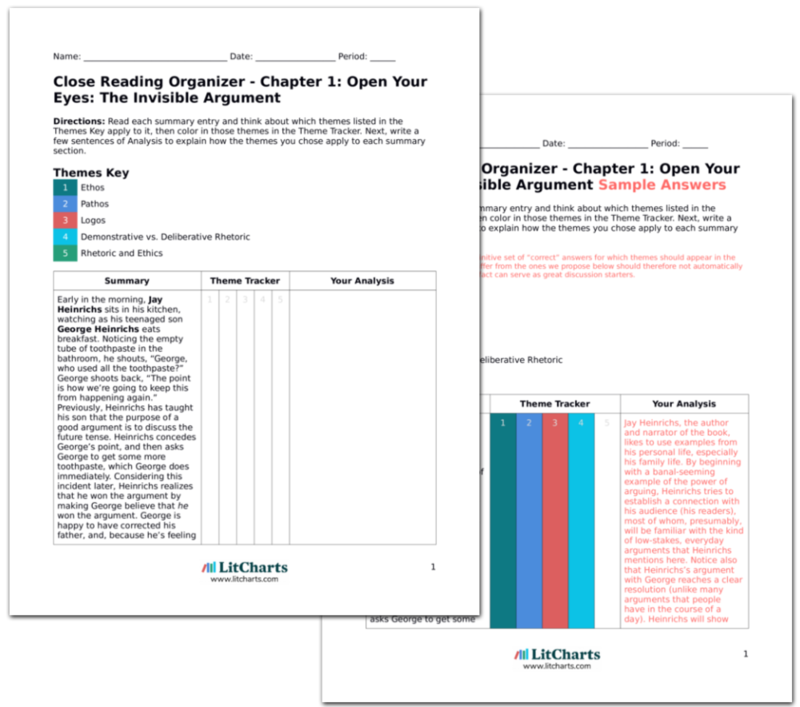 Retrieved April 22, 2019. https://www.litcharts.com/lit/thank-you-for-arguing/characters/aristotle.